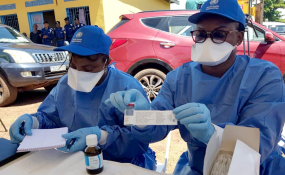 The Government of Democratic Republic of the Congo, with the support of WHO and partners, carried out a vaccination campaign in high-risk populations against Ebola virus disease in affected health zones. The charity Doctors Without Borders warns a climate of deepening mistrust and suspicion in the eastern Democratic Republic of Congo is hampering efforts to bring an Ebola epidemic under control. The outbreak, which started, last year, has killed more than 500 people in North Kivu and Ituri provinces. Doctors Without Borders, known by its French acronym MSF, has suspended its Ebola activities in Katwa and Butembo in North Kivu Province. This follows attacks on two of its treatment centers last week. In the last month alone, the agency says more than 30 attacks and security incidents have taken place in this volatile area. International MSF president Joanne Liu says the Ebola epidemic, the largest ever in DRC, is taking place amid growing political, social and economic grievances. She says many communities believe Ebola is being used as an excuse for political maneuvers. Liu says the decision to exclude two areas — Beni and Butembo — from voting in the December presidential elections has only added to the suspicion that Ebola is being used as a political tool. Latest reports from the World Health Organization put the number of Ebola cases in eastern Congo at 907, including 569 deaths. Liu tells VOA the government is painting the Ebola epidemic as a security emergency. She says MSF worries about the disease being framed as an issue of public order. Liu says coercion must not be used as a way to track and treat patients, to enforce safe burials or decontaminate homes. She says communities must be treated with respect and understanding. She says patients must be treated as such, and not as some kind of biothreat.